"How long is a piece of string?" That's an easy one. "What's the meaning of life?" 42! "Will I ever win the lottery?" – ah, well that really is a tough question to answer, but hey, we're going to do our best to answer it anyway! We've all done it at some point - as the workday drags on slowly we stare out the window daydreaming about winning the lottery. Later we snap out of it and ask ourselves, "will I ever win the lottery?" Well, the great thing about that question is that there's only two answers, yes or no. This gives you a 50-50 chance. So, based on that criteria we could just go ahead and say yes, and we'll have a 50% chance of being correct. That's a passing grade, a majority win – a coin-flip chance. Though it's also wildly inaccurate, because, as we all know, lotteries are about beating far bigger odds than a mere 50/50 split. In our last post, "which lottery is the easiest to win? ", we looked at the different lottery odds, jackpot and otherwise, to help you determine your ideal lottery game. If you haven't read the article yet we recommend you do so, to help find the lottery which best suits your specific preferences. It doesn't matter if you're playing with a ticket in store, or betting on the outcome at Lottoland, our sage advice works for both! As the article explains, not all lotteries are created equally – some offer enormous jackpots, but at insanely high odds. Others offer far more favourable odds but the prizes aren't quite so dramatic. Then there are other lotteries offering a balance between both. So, in other words, the best way to beat the odds is to find a lottery with odds that are easier to beat. Winning the lottery is all about beating the odds. And the odds against you are quite high. Picking a lottery with lower jackpot odds is a good start, but to really drive those odds down you need to participate regularly. If you think about it a little it starts to make sense. Let's take the Irish Lotto, for example. It has jackpot odds of 10.7 million to one, hardly the odds you'd want on a horse at the Grand National, but exceptionally good odds for a lottery. 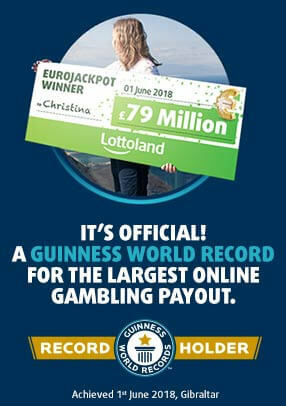 Now if you decided to enter the Irish Lotto just once in your lifetime gives you a very slim chance of winning. But let's say you entered both the Wednesday and Saturday draws, the odds against you remain the same, but now you have two chances of winning instead of just one. If you enter it every week for a year, again each draw is a separate event so the odds remain the same, but you now have 104 or more chances to win. A hundred-plus chances to win, no matter how high the odds, is a lot better than simply one. You're also certain to win a prize – it may not be the jackpot, or even one of the bigger prizes, but you're guaranteed to win something! And so far we're only talking about a basic, single-line game. Don't forget that the Irish Lotto, and many of our other lotteries, also have additional bonus games giving you even more ways to win. Come to those who wait. And while we cannot guarantee you'll ever win the lottery it should be pointed out that, of those that do, a large proportion are people who have been entering into their favourite lottery draw consistently, every week, without fail. You'll notice it's a common theme on winner stories – and for good reason. Because it pays to be persistent! Where Is The World's Biggest Wage?